Save Up to 15% on your Auto Insurance Premiums! Are you 55 and over? Do you have a valid California driver's license? Take a Mature Driver Course to for a mandatory insurance discount! A California mature driver course allows drivers ages 55 or older to review the latest driving laws and skills for navigating the roadways safely. Your auto insurer is mandated by the State of California (CA Insurance Code Section 11628.3) to provide you with a discount on your auto insurance after you successfully complete the the mature driver improvement course. In 2007, California made classes much more user-friendly by allowing them in online-only format. By enrolling in the exclusively online course, consumers can peruse materials at a pace that’s comfortable for them as they enjoy an increased level of scheduling flexibility. Driving in an impaired state: How impairment to visual and auditory acuity impacts driving competency and how to make up for the deficit. DUI: The impact of medicines, alcohol and fatigue on driving competency, along with preventive methods for averting danger. Road safety skills: Safe and effective driving methods in modern traffic situations, along with refreshers on driving-related laws and equipment, including use of seat-belts. Planning prior to a drive: How to schedule adequate time for traveling and choose the safest and most-efficient routes. Using good judgment while driving: How to make quick, vital decisions in rapidly changing, unsafe situations. In addition, drivers may choose between two types of California Mature Driver Course: an introductory course and a renewal course, which have different duration. Once a driver has taken the introductory course and earned a certificate indicating completion, the driver is eligible for an auto insurance discount for completing a mature driver improvement course. After the three-year expiration, drivers must take the renewal course to continue receiving the insurance discount. More than four years have elapsed since you completed the initial course. Fewer than four years have elapsed since you completed the introductory course. Living in California can be pricey for motorists. 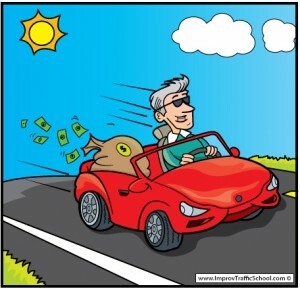 But if you are 55 years of age or older there is an easy and efficient way to reduce your driving costs. Our Online California Mature Driver Improvement Course is simple and was created specifically for older drivers. By completing the course, you can earn an auto insurance discount of up to 15%. Our course has been approved by California’s Department of Motor Vehicles and is authorized for the state’s required three-year insurance discount available to drivers who take a course to improve their skills. Enroll Today to Save on Your Auto Insurance!